There simply were no other towns. Crane was situated in the middle of nowhere. SMALL towns tend to be alike. People know one another; dogs sleep leisurely on front porches, and life goes by in a unhurried, measured pace. Small towns are like that, but some small towns are different, at least in a small way. 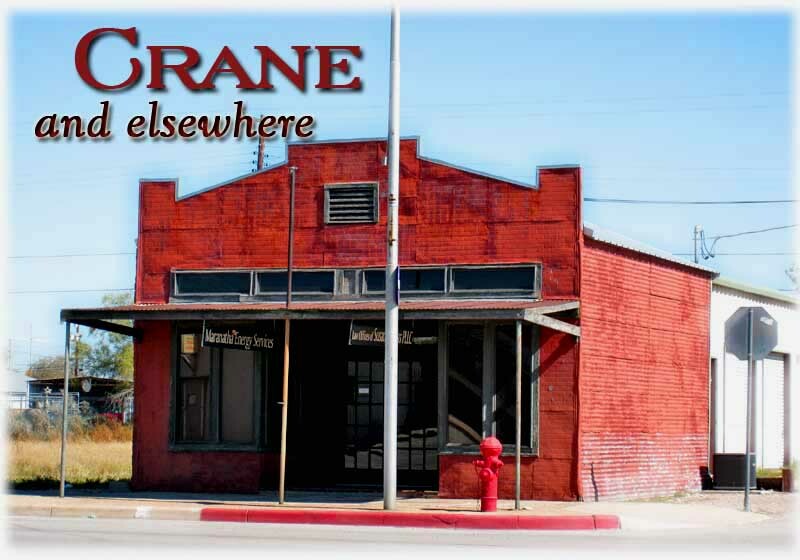 Crane is one of those different small towns in that vast area called West Texas. For one thing, almost everyone who lived in Crane County lived in Crane. There simply were no other towns, not even a momentary whistle-stop for a passing train. Crane County did have a railroad, but the railroad merely touched a corner of the county on its way to somewhere else. There were no train stations in Crane, nor anywhere else in the county. Indeed, if anyone went to Crane, it was because there were simply no other destinations: not another town, not a berg, not a village, nor even a row of houses built within miles of one another. Crane literally was in the center of nowhere, an island in a vast ocean of land. The closest settlement of any kind was beyond the county line, at least 35 miles or more, or so it seemed. A few people, though, lived in the county, but not in Crane proper. Such were the ranchers, and the Hooper’s were one of those families who lived in the country but never in Crane itself. Because the closest neighbor lived, perhaps twenty miles away, the Hooper’s did not lock the door to their small home. No rancher did that. There simply was no need to, at least, during the day. After all, coyotes, horny toads, rabbits generally prefer the great outdoors over the confines of a small house. It was one of those lazy, ordinary days when Mrs. Hooper put a chicken into the oven. Her sons were out somewhere tending to the cattle, and her husband, too. She had no idea when they might return to the house, but the chicken would be there for a hungry family. At least, that is what she had hoped. She left to go to Crane; she needed to buy some supplies, and would be back later. A neighbor dropped by while Mrs. Hooper was away. “Anybody home?” asked Tad Henderson as he knocked on the screen door. There was no answer from within, of course. The only sound was the ticking of a grandfather clock. “I think I smell chicken,’ said Tad to himself. “Mrs. Hooper, Mrs. Hooper? Is anybody home? That chicken smells real good.” He decided to go inside; the Hooper’s would not mind, and that chicken kept smelling good. Tad was beginning to get hungry. It was almost noon, and he had stopped by the house just to be neighborly. A delicious aroma wafted its way through the air. Tad soon found himself at the oven, and he opened the door. Maybe just a small bite would be OK. He soon found himself seated at the kitchen table, and he began to eat a small portion of that chicken. But bite followed bite, and before he knew it, Tad found himself as having eaten the whole chicken. The least he could do, he thought, was to leave a note of appreciation, and he did. No, in case you may wonder whether the Hooper’s were angry, they weren’t. That’s just how life unfolds in Crane. Such it was and such it is in Crane and elsewhere, where towns are small, people are friendly, and the sky is large on all sides of a distant horizon, and sometimes the chicken is too good to resist.